There is an additional potential for confusion here, because there are two types of ‘hits’. The hits we are discussing in this article are the hits recorded by log files, and interpreted by log analysis. A second type of ‘hits’ are counted and displayed by a simple hit counter. Hit counters record one hit for every time a webpage is viewed, also problematic because it does not distinguish unique visitors. Here is an article discussing hit counters. 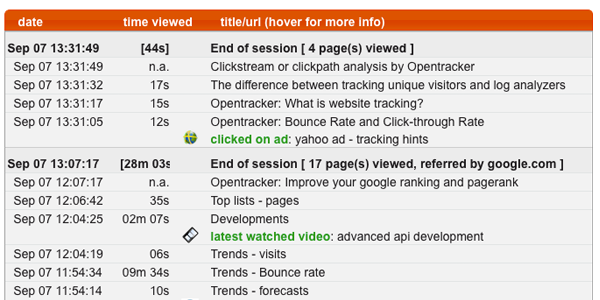 Opentracker measures unique visitors, which we track over long periods of time by giving them a cookie, this cookie is unique to their browser. We have found that cookies are often more reliable over the long term, as many servers re-assign IP addresses on a regular basis. IP usage patterns are changing. AOL, for example, has recently implemented a rotating IP address technology, to stop log files from tracking their members’ search term queries. How reliable are cookies when tracking unique visitors? Unless the user deletes their cookies continuously, they will be measured as the same visitor with each visit.